Wyatt-MacKenzie is an award-winning independent publishing company in Deadwood, Oregon, founded in 1998 by Nancy Cleary, known for providing an unparalleled author experience. Okay... I can't contain my excitement! For the last year we have been working on our September release WOMEN'S GROUP which is the bookend to the author's 1977 novel. 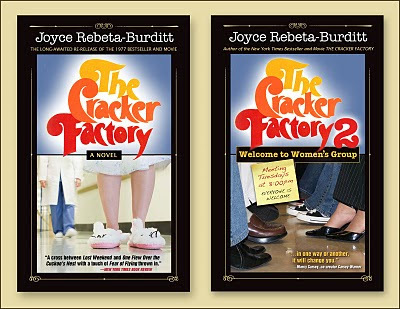 We have now signed the re-release of the first book THE CRACKER FACTORY (New York Times bestseller, turned into a made-for-TV movie)! The New York Times called it "A cross between 'Lost Weekend' and "One Flew Over the Cuckoo's Nest'… with a touch of 'Fear of Flying' thrown in." Chicago Tribune reviewed, "Picture TV's Rhoda with a drinking problem, put her into a female version of 'One Flew Over the Cuckoo's Nest', and you have 'The Cracker Factory' in a barrel." Los Angeles Times wrote, "A frankly autobiographical and hilarious novel … Comparisons are bound to be made with 'One Flew Over the Cuckoo's Nest' but I found Rebeta-Burditt's book much more effective than Kesey's because its insights are not those of an interested spectator but of a walking wounded, a hurting actor in the hospital's ongoing drama… A novel that will shake you, delight you and lift you high, as only fine writing can." Stay tuned for more big news on these titles…!